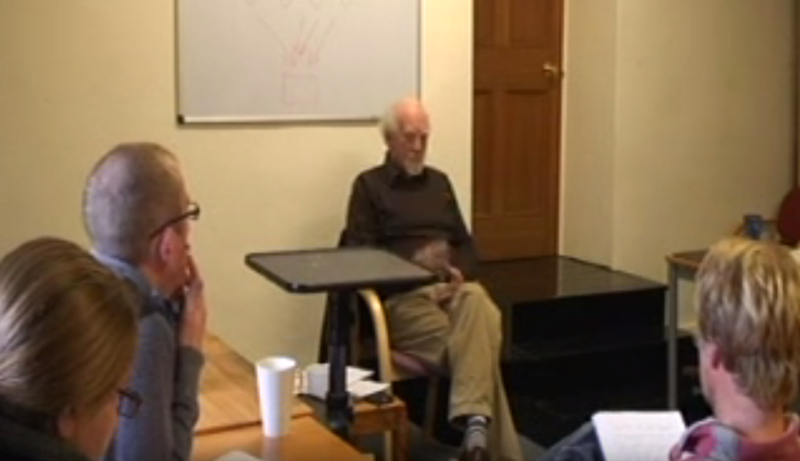 I am pleased to be able to introduce this final lecture from Henri Bortoft from 2009 at Schumacher College. If you have not already seen it, you may wish to read my introductory article which explains the background and context of this series of lectures: The Henri Bortoft Lectures: Introduction. Henri starts by reflecting on the nature of participatory consciousness, rather than that form of intellectual consciousness which leads us to perceptions of separation from nature. Various parts of this particular conversation with our group are cited in Holonomics as the comments add a lot of clarity in understanding the dynamic conception of wholeness in nature, including concepts such as ‘coming-into-being’ and archetypes in Goethean Science. Feelings and appreciation develop, and I find that what happens to me is I get an expansion of the heart. Sometimes I experience it as if it is written into the heart. But that comes later. It can happen spontaneously. Your feelings are not just being subjective; it is feeling, not emotion. This is a key thing. Feeling becomes an actual organ of perception itself. This is beyond exact sensorial perception. Feeling itself becomes an organ of perception and that is what it should be. When it is emotion it is not. When we are emotional our feelings are screwed. We do not actually have perceptive feeling when we are emotional, but that is the time we think we really are. When it calms down, there is perception through feeling and it is very fundamental. The big thing about the sensory world is that this is where the livingness is, and you become more attuned with what is alive and what is living. The verbal intellectual mind cannot reach this. The verbal intellectual mind brings us into contact with what is dead in things; but we often think it is the most wonderful thing of all. You come to this understanding of this dynamic movement in life. The verbal intellectual mind is perfect for dealing with the logic of solids and finished objects. Trapped in our logical and rational minds, all that we are able to perceive is our separateness from nature, a disconnection which arises from our being lost in our abstract and conceptual way of thinking; we have long since discarded any reverence for our sensory experiences through which we experience an intense connection to nature. Henri finishes the formal part of this lecture with what he describes with as a twist, and this is a major misconception of Descartes. So as not to include any spoilers, I shall simply mention that this is written about by Henri in footnote 40, page 188 of Taking Appearance Seriously, and also in chapter 4 of Margaret Wertheim’s Pythagoras Trousers: God, Physics and the Gender Wars which Henri references. As a historian of science, Henri takes us through his understanding of the battles for the access to the truth in this era. One aspect of this particular lecture that is of historical interest is the conversation I have with Henri at the end, where I ask him about the work of David Bohm, especially in relation to consciousness. Henri studied the question of wholeness in quantum physics with David Bohm in the 1960s. Bohm was one of the world’s top physicists in his field, and tragically, as Henri explains, he was extremely close to winning a Nobel prize shortly before he passed away. Bohm proposed that particles have both a wave aspect and a particle aspect at one and the same time, as opposed to the wave aspect collapsing into its particle aspect at the point of observation which others had proposed. Bohm used the analogy of a ship being guided by radar, in that the wave (or field) aspect of quantum system, such as an electron, influenced the particle aspect. Bohm saw matter being enfolded and unfolded in a higher dimension of reality which he termed the implicate and explicate order. Henri read Bohm’s manuscript discussing the implicate and explicate order in the early 1970s. While Henri was extremely excited when he read the pre-prints, as he says, he had already come across the terms such as implicate, explicate, enfolding, and unfolding before, because he had seen them in Karl Jasper’s monograph on Nicholas of Cusa. So what Bohm had done done was to take the language of medieval philosophy and “reintroduce them in a new way, with a twist”. He didn’t say that he was doing this. Bohm never acknowledged this source of inspiration because as Henri suggested, “if he had said he was going to reintroduce the language of medieval physics, then because every physicist “knows” that this is wrong, it is about the worst career move he could have ever made”. Henri then continues to talk about Bohm’s followers and he pulls no punches in explaining what they get wrong about their understanding of Bohm’s implicate and explicate order. In this lecture Henri suggested to me that quite possibly the best book about Bohm was written by another colleague of Bohm, the Finnish philosopher Paavo Pylkkänen in Mind Matter and the Implicate Order. Henri finishes the talk by reading his dedication to Bohm in The Wholeness of Nature – “To the memory of David Bohm who introduced me to the problem of wholeness”. I sincerely hope that these lectures have been a deep and profound introduction to wholeness for you, an exploration which has taken us through the history of science, philosophy, from Plato, to Spinoza, to Goethe, Heidegger, Gadamer, and of course Henri’s own great works. In my final article in this series, I will end with a look at the way in which Henri’s work is being applied in design, business and ecology, and I will offer a mini-bibliography and further references to allow you to continue your studies. These references can be read to accompany this lecture. These lectures are ©Jacqueline Bortoft and has been made available with the kind permission of both herself and Schumacher College (www.schumachercollege.org).